Hand made by british cratsmen, using traditional joinary skills creating a beautiful distinctive gate that will last for many years. Part boarded with a concave single bowed head on each leaf and styled pales and available in durable Iroko untreated hardwood. Further treatment with a moisture permeable preservative is essential prior to installation. 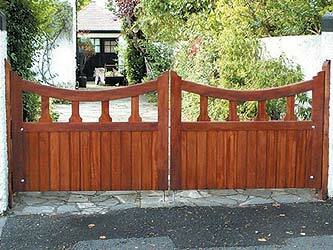 Professional advice should be sought to hang this type of gate. Recommended Gate Post size listed below and for height allow for 3' 6" more than the height of the gate for burial purposes.